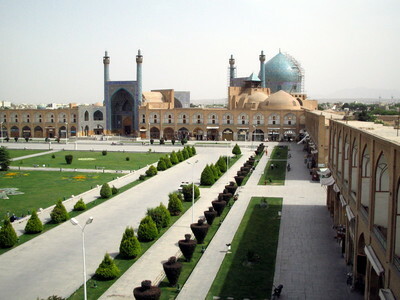 Masjid-e Shah, Esfahan, 2009. Photograph Via Wikimedia Commons. The facts about Iran seeking to acquire nuclear weapon capability were never in doubt. The Iranian leaders, by words and actions, left little doubt they were prepared to bend every rule in pursuit of securing nuclear weapons. The extent to which there were doubts about Iran's nuclear program — of how far the regime was prepared to go in defiance of UN Security Council resolutions forbidding Tehran from turning its peaceful nuclear energy program into nuclear weapons production — reflected the lack of will among Western powers to confront the Islamic republic. The release of the latest report on Iran by the International Atomic Energy Agency should remove all doubts in the West about Iran's nuclear program. The report states categorically: "Iran has not fully implemented its binding obligations, as the full implementation of these obligations is needed to establish international confidence in the exclusively peaceful nature of Iran's nuclear program." These obligations, as the report reminds members of the UN — in particular the five permanent veto-wielding members (China, France, Russia, the U.K. and the U.S.) — were mandated by Security Council resolutions adopted under Chapter VII of the UN Charter. In other words, Iran remains in violation of its obligations to the UN and in failing to abide by them could be held accountable with the Security Council moving to enforce its resolutions by force if needed. The IAEA report provides an annex with detailed analysis of Iran's nuclear weapons program, enrichment of uranium to weapon-grade level, design and testing of missiles, reliance on a clandestine nuclear supply network, working on an indigenous design of a nuclear weapon, and more. The report summarizes: "The information indicates that Iran has carried out activities relevant to the development of a nuclear explosive device." Since Mahmoud Ahmedinejad was elected president in June 2005 there has been an escalation of threatening rhetoric from Tehran accompanying the militarization of Iran's nuclear program. In October 2005, at a public conference in Tehran under the banner theme "A world without Zionism," Iran's president described Israel as a "tumour that should be wiped off the map." There is no mistaking what the current regime in Iran wants by its words and its actions. And there is also no mistaking the international community has so far abdicated its responsibility in checking a UN member state that openly calls for the elimination of another member state. The latest IAEA report should galvanize the Security Council to check Iran and enforce its outstanding resolutions. But to expect such an eventuality is to believe in alchemy, of watching lead turned into gold. The UN has failed abysmally to live up to the requirements of its own charter. It is not about to turn around and embrace the IAEA report on Iran given its pathetic record in disciplining Iraq under Saddam Hussein. It is an irony that the fecklessness of the UN makes for a much more dangerous world. The failure of the UN increases the probability of unilateral pre-emptive measures against Iran by one or more states. If this is what is needed to stop Iran from acquiring nuclear weapons, the UN will be entirely responsible for such an eventuality and its consequences.